It is one of the towns that Catherine Rehart had written that “faded away.” It was so named in 1872 by Leland Stanford as he visited the Central Pacific railroad construction at the switch of the line near Avenue 12 at Cottonwood Creek and the later Highway 99. During the visit, Stanford had been hosted by Dr. Joseph Borden. The location was the Alabama colony which was founded in 1868 in what was still Fresno County. The name Arcola was not to be. Two years later in 1874, Borden was on the ballot as a choice for the new Fresno County Seat. My affinity for the place comes from the family stories of farming there. The Justice family had migrated from Lawrence County Tennessee to Fresno County in 1928, then to Borden in early 1930s. The town had long since vanished, but there was still a packing shed on the switch on the east side of the tracks. My grandmother Winona told me of packing peaches there. I had visited several times the farm on Avenue 12 of a great uncle Allen Roberts and great aunt Sadie Justice Roberts. Other Justices owned or leased land there. Mom told me of living on the west side of the highway 99, near the Casa Grande Motel. 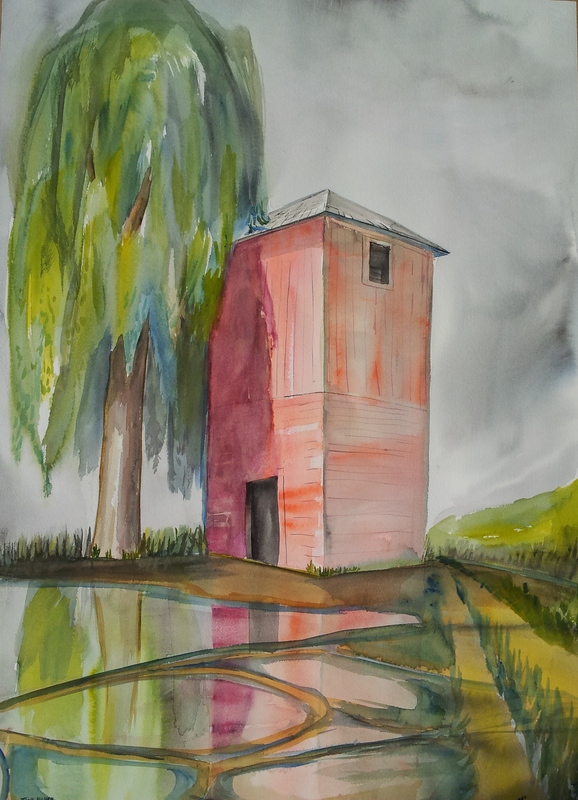 Her sister Sarah Zoe Justice Todd painted a picture of the tank house and tree. Long lost, the painting looked something like this one. Another sister, Opal Florene Justice Root and her husband “Pete” farmed cotton there. If there is a photograph of the Borden Station building, it has not been found. The station building was destroyed in a fire. Lost in much of the conversation are the histories of the folks who established the Alabama Colony after the Civil War. Many were Confederate veterans. As supposed that they were seeking a new life in a new state, a new county, a fresh start, one wonders if they wanted to diminish their past as Confederate soldiers. Local historians gloss over this, as if it is not important. In 2005, the Sons of Confederate Veterans’ local General Tyree Harris Bell Camp 1804 conducted a memorial event at the grave of Joseph Borden. He is buried at Arbor Vitae Cemetery. He was a Sergeant and then became 1st Lieutenant in Company D of the 5th Alabama Infantry. There are ten other Confederates buried at Arbor Vitae, and there may be others. Another Alabama Colony rancher, George Mordecai was a Private in the 2nd Richmond Howitzers of Virginia. He is buried on his private property and home on Madera Avenue just south of Cottonwood Creek. There is much construction going on now at Borden. 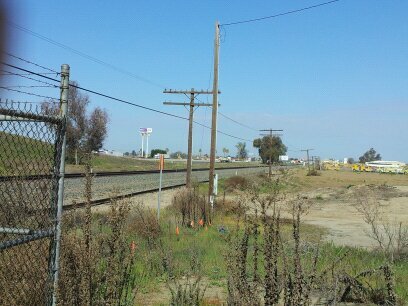 The “High Speed Rail” project is going ahead. And while there are still political, financial and logic arguments over the “train to nowhere” I was amazed, as many others, that the starting place is at Borden. It may be fitting that Borden Station may have a resurrection. By the way, before it was demolished I photographed the brick building that was a landmark for many years. 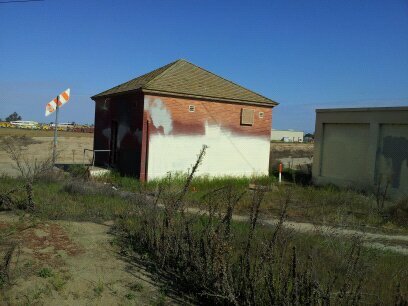 Do any of you railroad experts know what these buildings housed along the rail line? They were typical along Southern Pacific tracks. This entry was posted in Uncategorized and tagged agent, Art, author, blogging, Borden, California, commerce, Confederates, control, daily blogging, economics, editor, government, history, inspiration, legal, Madera, media, memorial, memories, plots, politics, populations, promotion, regional topics, sales, Story, theories, writers by timdesmondblog. Bookmark the permalink.